Blockchain entrepreneur and MarketOrders Co-Founder Sukhi Jutla was recently chosen by Westmont Enterprise Hub to become their Women’s Entrepreneur ambassador. This new vibrant start-up facility, which is part of University of West London (UWL), aims to support and encourage entrepreneurship. Westmont Enterprise Hub will link entrepreneurs with investment, business support, and University expertise to help them succeed and is a major boost for start-up businesses in the region. With already more than 20 start-ups and 450 members, the Hub has connections to more than 500 businesses and plans to double its number of start-ups by the end of the year. Sukhi’s role will involve advisory, inspiration, and leadership. Experience is gold, and Sukhi has got a lot of it through her career. Graduating from Royal Holloway, University of London after attending the local Ealing college and working in corporate finance, Sukhi wasn’t meant to be an entrepreneur. After a decade, she left the corporate world and explained her transition to entrepreneurship in her book ‘Escape the Cubicle: Quit the job you hate. Create a life you love’. After 10 years of being an entrepreneur, several ups and downs and a few mistakes, she has become a fulfilled business woman and a thought leader in the tech space. Indeed, she has been recognised by a number of industry awards including the Asian Women of Achievement Awards, Management Todays ’35 Women Under 35′ and named a Top 100 European Digital Pioneer by The Financial Times and Google. It’s International Women’s Day on Friday 8th March and to celebrate MarketOrders is co-hosting a number of events this week. We are passionate about supporting women in tech and our co-founder, Sukhi Jutla, is a leading role model and thought leader in this space who actively promotes, mentors and supports women into tech careers. Check out the below events, sign up and say hi! On the week of International Women’s Day, join us for an intimate breakfast roundtable for female entrepreneurs, a dynamic discussion with 25 female entrepreneurs. The breakfast will be hosted by two female investors from the leading VC firms. They will share their industry wisdom and tips for scaling your business. Welcoming all entrepreneurs, pre-startups, startups, founders, women and men in business, or those who are simply curious! Join our #WomenShine panel on Friday the 8th of March from 5.30pm for an insightful discussion & Q&A session from inspirational, empowering women in business featuring: our founder Sukhi Jutla, Randa Bennett – Founder and CEO of VeeLoop and Alex Thomas – Co-Founder of Tuk Tuk Chai. To mark International Women’s Day, Westmont Enterprise Hub is opening up this challenge to you…#MiniHubHack – giving you the chance to tackle three mini-business challenges in the areas of marketing, branding and finance set by our entrepreneurs. Come to the Hub, work in teams to brainstorm and develop effective ideas to help our businesses. At the end of the challenge, there’ll be an opportunity to present your great ideas! On Thursday 28th Feb, MarketOrders was invited to the London Business Awards as graduates from the Business Growth Programme. Our Head of Advertising, George Ceuca attended (centre in image below). The London Business Awards aims to shine a light on the successes and innovative excellence across London’s business community. The awards recognise a number of categories that encompass the accomplishments of the businesses London & Partners have supported over the past 12 months. The London Business Awards were attended by 700 of London’s CEOs, entrepreneurs, supporters of the Business Ecosystem and politicians including Mayor of London, Sadiq Khan and Deputy Business Mayor, Rajesh Agrawal. The awards give the opportunity to celebrate the growth of the city and the achievements of all the companies that are proud to call London their home. Congratulations to all the winners and MarketOrders is thrilled to be a part of this journey and to celebrate alongside you! 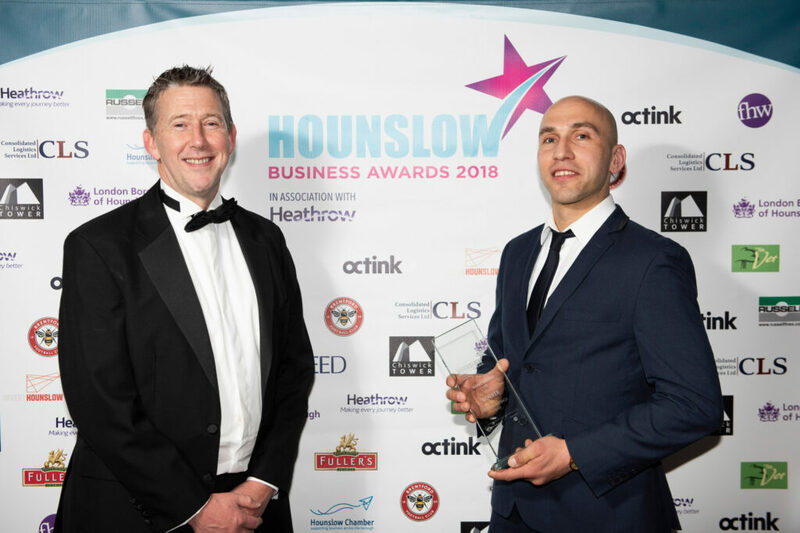 We are delighted to announce MarketOrders picked up the ‘Best New Business Award’ at the Hounslow Business Awards at a special gala dinner held at the Hilton Syon Park on Thursday 28th Feb. 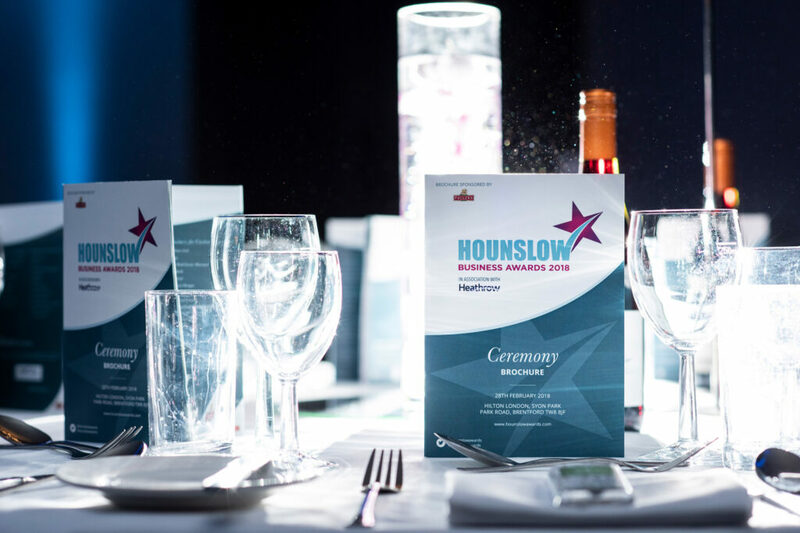 The awards are run by the Hounslow Chamber of Commerce and showcase the best businesses in the Hounslow borough. Hounslow’s most prestigious business event of the year was a glittering celebration of commercial excellence, innovation and entrepreneurial flair. As one of the most eagerly anticipated dates in the West London business calendar, the Hounslow Business Awards Dinner & Awards Ceremony, on Thursday 28th February at Hilton Syon Park was attended by more than 150 guests at this prestigious black-tie event, all of whom enjoyed a glitzy champagne reception, a sumptuous three course dinner and the glittering awards ceremony. The 2019 Hounslow Business Awards were hosted by local personality David Blackmore, a multi-media journalist for 15 years, David can be seen on Britain’s biggest daytime show This Morning with Phillip Schofield and Holly Willoughby. Our Chief Customer Care Officer, Krystian Ozog, picked up the award for MarketOrders and in his acceptance speech praised the team effort at MarketOrders and how it was important to showcase new business talent in the local community. 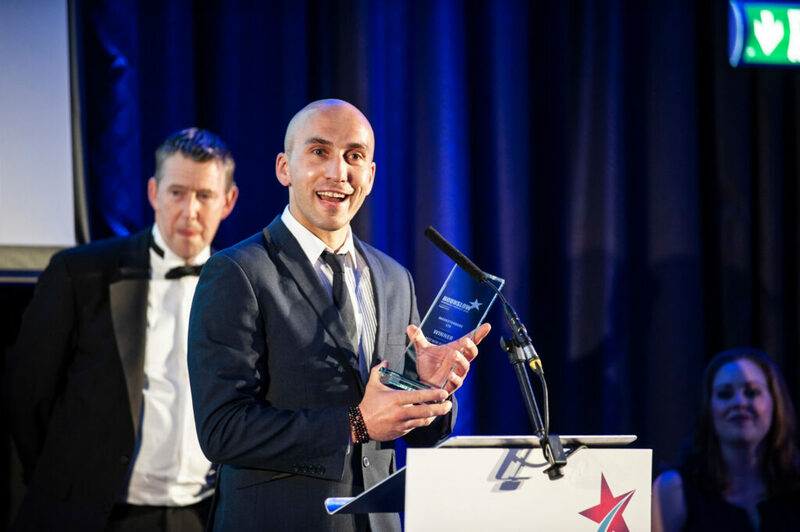 MarketOrders CEO and founder, Ram Krishnna Rao said, ‘We are proud of our achievements and to be showcasing the best of West London based businesses. To win this award is a testament to the hard work my team puts in daily to keep disrupting the gold jewellery industry with the use of tech’. MarketOrders was also named a Finalist in the ‘Entrepreneur of the Year’ Award and was also featured in the ‘’Highly Commended’’ category for Sukhi Jutla’s efforts in the tech industry, thought leadership and as a role model for women in tech. MarketOrders sends its heartiest congratulation to all the winners and finalists and is proud to be a part of this thriving economy in West London. 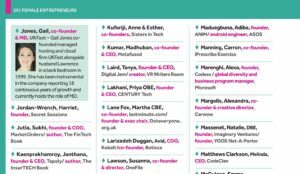 MarketOrders Co-Founder, Sukhi Jutla, was recently named as one of the UK’s top 100 Women in Tech. She recieved her award on Thursday 31 January during the awards ceremony taking place at the London County Hall, London. The award’s celebration was an opportunity to meet and network with other winners, sponsors and judges; enjoy a three-course meal, wine and champagne reception to toast achievements. The evening was facilitated by Kate Russell, BBC Click, Journalist, Tech Reporter and Author. The special guest speaker was Chi Onwurah, Labour MP for Newcastle upon Tyne Central and Shadow Minister for Industrial Strategy, Science and Innovation. Only two days after receiving its certificate as a Top 100 European Digital Pioneer by The Financial Times and Google, Sukhi Jutla couldn’t be prouder: “I’m honoured to be named as a Top 100 Woman in Tech in the UK. The UK is one of the best places to launch your tech career and I hope this award continues to inspire more women into tech careers and show you can make a huge and lasting impact”. Since September 2018, WeAreTechWomen has been searching the UK for the best female tech talent in the country. They received over 500 nominations from across the UK and Northern Ireland and 28,000 votes of support from across the globe. The calibre of entries for these awards was exceptional and all of the judges stated how difficult it was to arrive at the shortlist due to the amazing achievements of the nominees. Author of three books and World’s First #1 Bestselling ‘Blockchain’ Author, Sukhi and her team launched MarketOrders in 2016, with the ambition of evolving the gold and diamond jewellery industry using technology. Two years later, MarketOrders is a running online B2B platform helping independent retail jewellers to get the products they need faster, cheaper and direct from global suppliers. Over a thousand products are available and the platform serves UK retailers and partnered with suppliers in four international locations: Hong Kong, Singapore, Dubai and India. On Wednesday 30 January, Sukhi received a great news from Hounslow Chamber of Commerce and the Hounslow Business Awards team. She and MarketOrders have been shortlisted respectively for Entrepreneur of the Year and Best New Business. MarketOrders is currently preparing its crowdfunding campaign which will be live in February. The funds will be invested in the expansion of the team, technology development and marketing. Jan 11 2019: In this article, our COO Sukhi Jutla gives her views on the crypto markets and the associated volatility. Jan 12 2019: The market situation is worsening and major sell-off events are being observed in the crypto space. Analysts and experts, however, were not very surprised by the sudden plunge in valuations of most of the cryptocurrencies. According to Sukhi Jutla, the founder & COO of MarketOrders, the market plunge was barely a natural market correction because it was overinflated last year. 18 Jan 2019: “I Believe it Does Have the Potential to Become Digital Gold” – COO MarketOrders on Bitcoin. Although the market is showing subtle growth, the momentum building is still missing, and the direction of the market is still undefined. Sukhi Jutla, Founder & COO of MarketOrders believed that the uncertainty might continue for quite a while. MarketOrders was recently invited to be interviewed at the prestigious London Stock Exchange Studios in the heart of the financial district in London. MarketOrders is an online marketplace helping independent retail jewellers to source the products they need faster, cheaper and direct from suppliers. The gold industry is very old fashioned and has not fully embraced technology and this is where MarketOrders is helping to streamline the processes. Sukhi Jutla is an award-winning entrepreneur and author of 3 books. She is the co-founder of MarketOrders, an online B2B platform for the gold and diamond jewellery industry. She is a leading international speaker, influencer and thought leader in tech and a qualified IBM Blockchain Foundation Developer. She is recognized by a number of industry awards including the Asian Women of Achievement Awards, Management Todays ’35 Women Under 35′ and named a Top 100 European Digital Pioneer by The Financial Times and Google. In April 2018 Sukhi made global headlines when she became the World’s First #1 Bestselling ‘Blockchain’ Author. Buying jewellery is an emotional experience and most times it is being purchased for a special person or a special event. This is why so many jewellery purchases happen in-store rather than online. But this is because no trusted marketplace exists which gives both the customer and retailer confidence to buy and sell online. In the past, most purchases were done instore and the jewellery industry is not usually associated with embracing technology. But this is all changing. At MarketOrders we have seen the trend shifting to embrace technology in the jewellery market. We work hard every day to help our customer, the independent family jeweller to thrive on the high street by using MarketOrders as their technology partner. We do this by leveraging the power of technology which allows our customer to access products globally using our marketplace. MarketOrders is helping to create this by becoming the leading marketplace globally to offer the widest choice of products through one secure global jewellery marketplace. It is a paradox that the more globally connected we become the more locally we tend to shop. The consumer journey typically starts on the mobile device but is increasingly ending up in the physical store. An increasing amount of people actually prefer to go to store. According to new research from Vista Retail Support, 81% of UK consumers see the physical store as vital to the shopping experience and 70% say they enjoy the full experience of going into stores to browse, see what’s new and buy what they like. The exciting use of technology will entice more consumers inside a store, research from Vista Retail Support showed 61% of consumers would visit regularly to use virtual and augmented reality applications, smart mirrors and interactive gaming. We will see an increasing number of stores offering virtual experiences. Imagine putting on a headset in store to see the mine where your gold and diamonds came from! Retail jewellers will continue to embrace customisations as they will begin to understand that customers will purchase more when they receive personalised recommendations and offers on smart devices. There will be an increasing trend and need for jewellers to better understand their data. This market segment is increasing, has purchasing power and most importantly are digital savvy. They embrace shopping online as well as making the majority of purchases through their smart devices. The jewellery industry will become more mobile optimised as they start to adapt to this new customer who values exciting, transparent and smooth shopping experiences. This generation also values experiences and would come in store if the experience was exciting. MarketOrders named on BusinessCloud’s 301 Female Tech Trailblazers list. MarketOrders is pleased to announce their co-founder and COO, Sukhi Jutla is named as a Female Tech Trailblazer by the latest list announced by Business Cloud. The list is made up of everybody from household names to inspirational women at the start of a journey in tech who have the potential to change the industry. The list is published online at Business Cloud as well in the Q4 2018 print edition. MarketOrders helps independent retail jewellers to source the products they need faster, cheaper and direct from suppliers through our innovative tech platform and marketplace. 2018 has been an incredible journey of both growth and new learnings for the team at MarketOrders. In this post, we share our highlights of 2018 and hope you also enjoy this recap of 2018! We share our progress, awards won and how we are contributing to a more inclusive and diverse tech community. MarketOrders invited to The London Stock Exchange Studies for an interview on technology trends in the gold industry. Interview coming soon! MarketOrders announced a Top 100 European Digital Pioneer by The Financial Times & Google beating 4,000 nominations across Europe! MarketOrders doubles in team size- welcome to Sinead, Andrew, Caroline, Karen, Filip, George, and Joel! In 2019 we have big plans so watch this space. You will even have a chance to be a part of the MarketOrders team as we prepare to crowdfund soon. Sign up to the newsletter to stay up to date or drop Sukjhi or Ram a message on LinkedIn. We will be focused on expanding our UK market share, entering into European markets, focused on new customer acquisition and exponential growth. A massive THANK YOU to all our customers, partners and team and everyone who supports us in growing and developing MarketOrders.